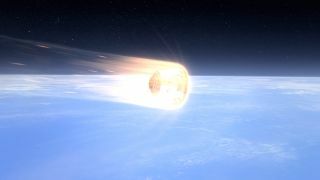 Artist's rendition of SpaceX's Dragon spacecraft as it returns to Earth. Dragon's PICA-X heat shield protects the vehicle as it returns to Earth like a burning comet. The private spaceflight company Space Exploration Technologies (SpaceX) is counting down to the return of its commercial Dragon space capsule from the International Space Station, and there are several ways to watch the historic flyby online. SpaceX's robotic Dragon space capsule will splash down in the Pacific Ocean on Thursday, May 31 at 11:44 a.m. EDT (1544 GMT). NASA will broadcast and webcast the orbital flyby live on NASA TV beginning at 2:30 a.m. EDT (0630 GMT). SpaceX's Dragon launch to the International Space Station on May 22 began a pivotal test flight for NASA's plan to rely on commercial spacecraft to provide cargo and crew transportation services for space station missions. SpaceX has a $1.6 billion contract with NASA to provide 12 unmanned cargo delivery flights. The company is one of two firms with a supply services deal (Orbital Sciences Corp., of Virginia is the other). With NASA's space shuttle fleet retired, the space agency is currently depending on Russia, Europe and Japan for cargo deliveries to the space station. Russia also provides the Soyuz spacecraft that ferry crews to and from the orbiting lab. SpaceX and three other companies are also developing their own manned spacecraft in hopes of providing crew launch services for NASA and other customers. So tune in to SPACE.com to watch SpaceX's historic Dragon space capsule mission return to Earth on May 31.